Today would have been my father’s 87th birthday. 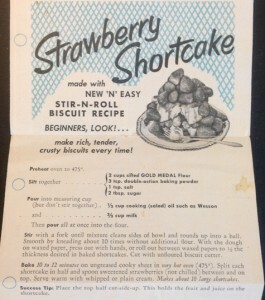 My mom would usually make him strawberry shortcake, since that was his favorite. This is probably pretty similar to the one my mom made. My dad died in 1978 at the age of 50. I think of him often. He set us all on a good path, and for that I’m grateful. He was a retailer and a great businessman. For him the customer always came first. He used to say that it is a lot cheaper to keep a customer than to find a new one. That’s left a great impression on me as I continue to strive to make the customer/user experience better with Recifoto. The new update will be an improvement, and will tweak some of the existing features as well as adding things that didn’t make it into previous versions. I’ll update you on those soon! If you don’t have ReciFoto, download it now for free: ReciFoto for iPhone/iPod and/or ReciFoto for iPad! Start playing with it now, and you’ll be able to get the free update in a couple of weeks. If you have any questions, write to support@recifoto.com or tweet to @recifoto.